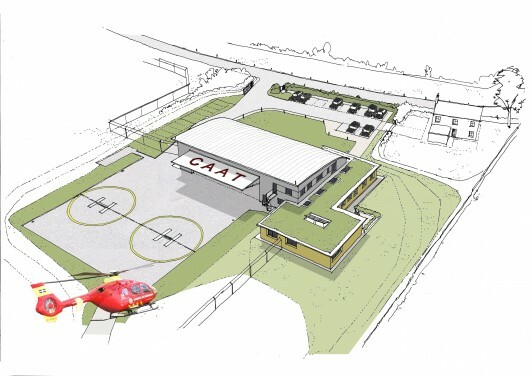 Cornwall Air Ambulance Trust (CAAT) has been awarded almost £1 million of ERDF Convergence investment to build a new base for the charity and its helicopter at Newquay Cornwall Airport. The investment amounts to £949,760 from Convergence with further costs for the capital project to be matched by reserved charitable funds and additional fundraising. The development includes a 492 sq m hangar for the Cornwall Air Ambulance helicopter and 335 sq m of high quality office space, providing accommodation for both operating crews and the fundraising team. Chief executive of CAAT Paula Martin said: “Strategically, this charity is growing quickly, mainly because we need to meet the costs of operating a busy air ambulance helicopter. “Part of our forward planning is to secure an operations facility, a proper ‘home for the helicopter’ and ensure we can manage most of the key costs in the future. The building will be situated on the south side of the main runway at Newquay Cornwall Airport and it is hoped work will be completed later this year, with plans for the air ambulance to be operating from the new hangar before Christmas.